The diva came to 30 Rock Tuesday to perform her classic with a colorful twist. Mariah Carey joins Jimmy Fallon & The Roots singing a special rendition of her self-penned 1 holiday classic "All I Want For Christmas Is You." Diva Maria Carey visited the Late Night with Jimmy Fallon "Music Room" Wednesday to perform her classic Christmas song -- with a twist. 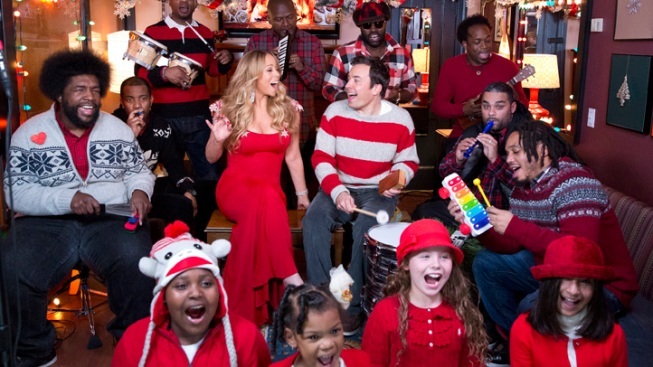 Carey was accompanied by host Jimmy Fallon, house band The Roots and school children in a fun, acoustic production of "All I Want for Christmas is You" featuring children's instruments. Fallon played a wooden block, tambourine, bass drum and kazoo, and one band member even played a Fisher Price xylophone.